For administration through feed or drinking water. Birds (breeding, replacement layer flock and meat chickens): Treatment and control of Chronic Respiratory Disease (CRD), mycoplasmosis caused by Mycoplasma gallisepticum, M. sinoviae and M. meleagridis. 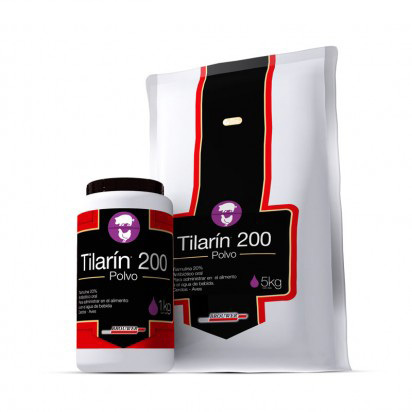 Complicated CRD, infectious synovitis, infectious coryza, airsacculitis, infectious sinusitis and other diseases caused by agents susceptible to Tiamulin. Swine: Treatment of Porcine Respiratory Disease Complex (PRDC): Enzootic pneumonia caused by Mycoplasma hyopneumoniae, pleuropneumonia caused by Actinobacillus (Haemophilus), PRC complicated by Pasteurella multocida. Porcine Enteric Disease Complex (PEDC): Ileitis due to Lawsonia intracellularis, colitis, arthritis caused by Mycoplasma hyorhinis, leptospirosis. It is also considered to be the only treatment for porcine enteritis caused by Brachyspira hyodysenteriae (swine dysentery) resistant to lincosamides y macrolides, as well as other diseases caused by agents susceptible to Tiamulin. Container for 1 kg and 5 kg bag.